I’m going to crunch down over 5 hours of research in 5 minutes. 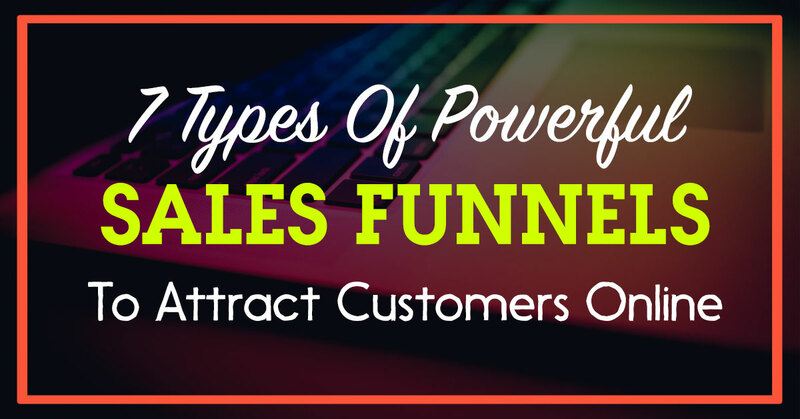 So, let’s dive straight in..
I’m going to be walking you through the 7 types of sales funnels. An Online Sales Funnel is nothing but a way by which you can get your customers smoothly into a process of becoming your customer. It is getting somebody who does not know you, Nurturing them, Warming them up, making them from a Cold to a Warm Prospect and making that prospect into a Lead online, is what is called an Online Sales Funnel. What are the components of a Sales Funnel? A magnet that can capture the lead or it could also be a One Time Offer (OTO). You need to have a landing page or a delivery system where you can provide whatever you are offering whether its a Product or Service. You need an email auto response system because as and when you get inquiries, you need to be able to follow up with them quickly to offer them whatever you are doing. Let’s say if you’re doing an ebook give away, you need to find an efficient way to give them the ebook. If you’ve been watching my 5 minute videos, whenever I ask you all to give a particular set of words in my chat box, my chatbot sends you that information and that entire piece is part of the delivery process. 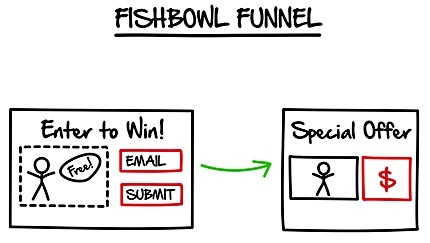 So, these are the components of a Sales Funnel. Now, why do you need a Sales Funnel? You don’t want any junk leads coming into your system. So, by having proper sales funnel set up, you can have qualified customers and the best part is you can start making more money on autopilot, if you have something valuable to offer. In the typical sales funnel, let’s say you do a video and from the video, the traffic goes to the Squeeze Page. A Squeeze Page is nothing but a page that squeezes out information from your customer in terms of their names, telephone number and email address and they get into a list. Once they get into a list, you can either send them a One Time Offer (OTO) or send them followup emails pointing them back to an offer so that they can buy your product or claim your service, whatever you are offering. You must have gone through this funnel in some of the campaigns you may be a part of. If you’re planning to write a book and want to become a best seller, then this is the Best Seller Book Funnel. By the way, I have started writing a book called the Digital Tribes and I’m using the same funnel. These snapshots, I actually learned this from one of my mentors, Russel Brunson, who is the founder of Click Funnels. They are a company that is awesome in creating Funnels and Funnel based Systems. So, I want to acknowledge that these snapshots I’ve got from Russel and Russel is the authority in creating funnels. After they buy the book, you can give them an OTO (video 1). You can sell them something else besides your $10 book. Maybe your book has a lot of valuable information. But after giving them the book, you can offer them your consultation or services or something that is more lucrative than just a 10 dollar book. 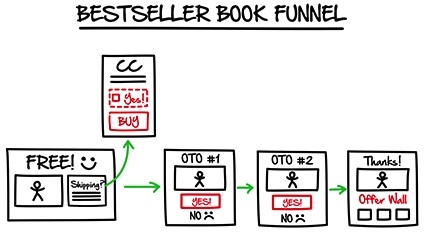 In that way, your funnel will monetize much more than the book. The book is only the door that opens to a Higher Value Product that you may be offering. So, you have the OTO #1, OTO #2 and then a Thank You Page in the end. All this can be in sequence. You can package a whole bunch of stuff in this particular funnel. Jeff Walker is the authority in this particular topic, the Product Launch Formula. So, in this, you get into a series of videos. Day 1, you will see Video 1, talking about Wow and how it really works. Then Video 2, is more of a Transformational Education. Video 3, you give them an Ownership Experience in terms of what is it going to be like on the other side. In Video 4, is where you actually sell your product. 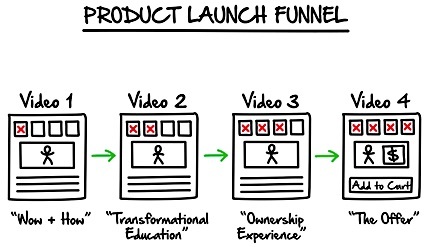 So, this 4 step video selling process is what I call as the Product Launch Funnel. This will work really well for selling any product. So, the first 3 videos are about Education and giving your customer a Value-Based Experience, for them to make a decision on Video 4, to buy the product and this works like magic especially, if you’re selling digital products online. 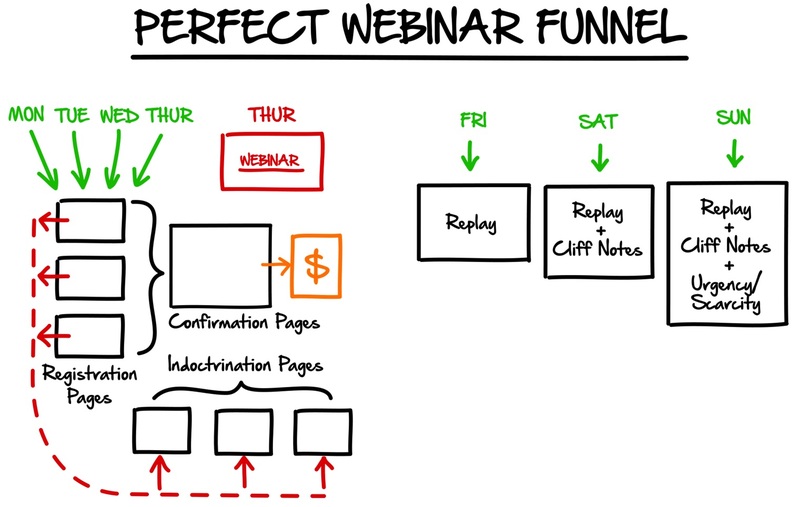 In fact, I do a lot of webinars and I’ve been testing a lot of these funnels. So, if you’re doing webinars on Mon, Tue, Wed, Thu, and when people register for the webinar, you will be sending them to a Confirmation Page. One option is on the Confirmation Page, you can sell something. You can sell your product/service. The other way is, once they come into your webinar, towards the end of your webinar, you can sell them your product/service. Let’s say somebody has missed the webinar or dropped out in between, on Fri, you can give them a Replay. On Sat, you can give them a Replay + Cliff Notes of the webinar. On Sun, you can give them a Replay + Cliff Notes + OTO on an Urgency/Scarcity kind of a mode where you get them to make a decision to buy your product/service and this is whats called as a Perfect Webinar Funnel. I’ve seen many marketers automate this whole process and make the buying experience so seamless that it works like magic. 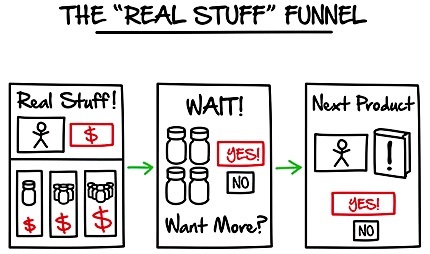 If you’re selling some real stuff such as Shoes or any Physical Product, a phone, a bouquet of vases or some kind of artwork, this is how it works. You’ll have a Landing Page with you speaking on a video about the awesome products you have and you give them a link to buy those products from you. This is what Amazon does. if you’re going to buy a product or have bought a product, it will show a few more products below saying that other people have bought a bundle of these products together. Why not go for all of them together? You can get a Special Deal. So in this funnel, you can monetize much more while selling a bundle of products to your customers than a single physical product. This you can use to sell anything physical. It is a funnel for that. This funnel works like magic for Contests/Promotions. So, you can have a video saying you’re giving away Free Tickets/Vouchers to the people who submit their name and email address. Once they enter their details, they come to a Landing Page where they have another Special Offer and sell them your product. But it has to be Relevant to the Audience and the offers have to match. So, they’re not only getting into a contest but they’re also able to claim an offer which they won’t get outside. Its called as a Fishbowl Funnel. The bridge funnel works really well for people, especially in the Network Marketing or Affiliate Marketing Business where you are selling other people’s products and not your own service/business. Let’s say you are promoting a company like Amway or Herbalife. Firstly, you need to have a Bridge/Bait Page where you’ll be giving a Free Report. Something like 10 ways to lose weight quickly. People give their name, email address and download the report. Just click on the button below, Herbalife if an awesome opportunity, click here and you send them to the Corporate Website where they go an register as an Affiliate or where they go register themselves online. This is what we call as the Bridge Funnel which works well for network Marketing or any other Affiliate Marketing types of products where you don’t own the product. You are selling other people’s products. Why this is important is because you shouldn’t send them directly to the corporate page. If you’re a network marketer watching this, don’t directly send your prospects to your Corporate Website. You need to have a bridge funnel. People need to trust you because in Network Marketing especially, people join people. 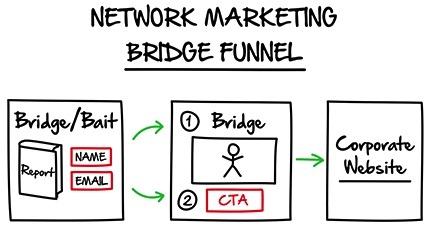 The opportunity is open to everyone and the best way to Create a Rapport/Relationship with others is to build a bridge marketing funnel like this. So, these are the 7 funnels. If you found this useful, I have something important to share with you. Before I go on to that, Click the SHARE button and share this on your Facebook Wall, right now. If you share this on your personal profile, not page, 2, 3, 4, 10, 20 people will benefit from this information and thank you so much for sharing it. Let’s pay it forward and help others too.